Where Has This Phillies Team Been All Year? The Phillies put a brutal 12-5 beating on the Cincinnati Reds last night. So where has this ball-pounding Phillies team been all year long? Oh that’s right; they have been on the disabled list. Sad. 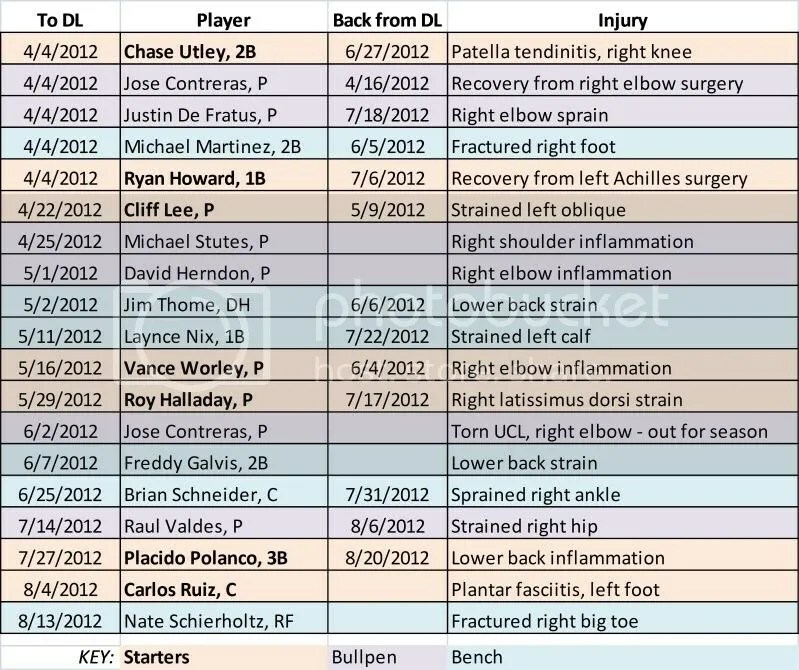 That is a lot of injuries. But with Placido Polanco returning yesterday, the Phillies now have most of their starters back, although some of them from the beginning of the season went to other teams in trades. And guys like Domonic Brown and Juan Pierre are making this look like a real line-up once again. Unfortunately, it is probably too little, too late. Still, any victory is a happy one. And the Phillies stomping all over the Reds last night was certainly fun to watch. And everyone in the line-up contributed. John Mayberry Jr. is suddenly on fire; he had 3 hits, including a 2-run homer. Pierre also had 3 hits and 2 stolen bases. Everyone in the starting line-up had at least one hit, which has been rare this year. Roy Halladay did not get a hit, and he did not pitch very well either. But it did not matter. The 5 runs he allowed were easily swept under the proverbial rug since the offense kept on scoring. They scored in every inning except the 2nd, so each run Halladay gave up did not seem like a big issue. The Phillies will go at the Reds again tonight and they will have a new, interesting player on the staff for this one. Remember that awful Cliff Lee trade a few years back…well, one of the fruits of that goof-up is now on the roster. Phillippe Aumont will take Jeremy Horst’s place on the roster as Horst is now on paternity leave for 3 days. Aumont has had issues. His control is not great and he is an emotional guy, easily rattled at times. He has posted a 4.26 ERA in Triple-A this year. I guess this is the Phillies way of throwing him into the fire to see if he burns. Best of luck to him! Game time is 7:05pm.